Noun 1. Beach game where you dig your heels into the sand and stand as if your about to go to the loo. 2. Standing up for what you believe in. In use: "Let's take a stand for life"
Ok, ok I'm sure you get the picture and no, I'm not trying to write my own dictionary. Take-A-Stand is a game my brothers and I "invented" during one of our several visits to the beach. 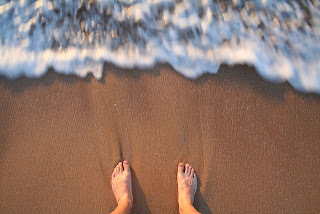 You simply stand as close to the shore are possible(hand in hand) and dig your heels into the sand so that when the waves come, you move forward slightly, but don't fall. Eventually you will fall, but the person who stands for longest wins, and is said to have "Taken-A-Stand-for-Life". In the famous allegorical text, Footprints in the Sand. It is said that GOD carried us when things were tough and there was turmoil. Hence, there was only one set of footprints in the sand. However remembering our game reminded me that we are required to stand for all that Christ represents. Are you compromised in your faith? Do you need to dig your heels in and live out the gospel so that your friends and family know who you belong to?